Springtime is just around the corner—that’s good news! But while the weather is getting nicer, the economic forecast remains uncertain. This makes your marketing efforts for your veterinary hospital more important than ever, particularly when it comes to your website. The internet is the first place pet owners look for a veterinarian, and so it is vital you maintain a strong presence online. This month, we share with you some tips on how to start a blog for your veterinary hospital and use it to promote your website and your practice. We’ve also got an informative article about the importance of keeping your website updated with fresh content and new photos. For more on the latest in veterinary practice marketing and pet trends, visit VetNetwork’s blog. And be sure to meet us at the CVC East Conference in Baltimore, April 24–27 – we look forward to seeing you there! Click Here if you would like to continue receiving our monthly eNewsletter. Almost everyone has a blog—does your veterinary hospital? A veterinary hospital blog is an exciting addition to your internet marketing plan that can draw new traffic to your website and bring new clients into your hospital. A blog can also act as an educational asset - you can use your hospital blog to keep in touch with the community and share important pet health information. Already, veterinarians across the country are blogging each day. 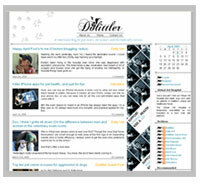 Miami veterinarian Dr. Patty Khuly has been blogging to her clients and other pet owners at dolittler.com since 2005. She writes about everything from pet news and trends to the rewarding and difficult aspects of working at a busy veterinary practice. Dr. Khuly gets “lots” of new clients via her blog. “I get plenty of new clients via Dolittler. But it’s not really about the quantity. The best part is that all the clients I’ve sourced online have become Class A clients. In this economy that’s a brilliant thing,” she said in an interview with VetNetwork (you can read our full interview with Dr. Khuly by visiting our blog). A number of VetNetwork clients have started blogging as well. 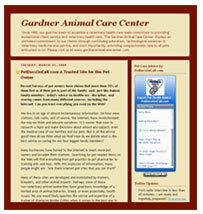 At Gardner Animal Care Center in Gardner, MA, Dr. Brian Hurley recently unveiled his own hospital blog. You can view Dr. Hurley’s blog by clicking here. In addition to the blog, Dr. Hurley is also making use of social networking sites like Facebook and Twitter. So far, he has received positive feedback from clients about the blog. “I have had a few clients comment to date and even had a couple post comments on the site. I know it will be a good thing, it will just take time, ” he said. Other VetNetwork clients are also blogging. 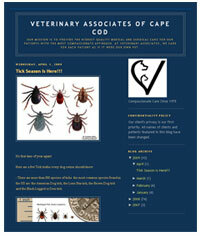 Dr. Tom Burns at Veterinary Associates of Cape Cod maintains a hospital blog at capecodvets.blogspot.com. Dr. Burns uses his blog to share medical information (such as a guide to tick season), local news items and stories from around the hospital. Dr. Michel Selmer of Advanced Animal Care Center in Huntington Station, NY, also keeps a blog about the latest pet care information. You can view his blog by clicking here. VetNetwork can help you create a blog for your veterinary hospital. We’ll work with you to design and implement a blog that integrates with your hospital’s website and provides the sort of valuable information that brings both existing clients and potential clients into your hospital. 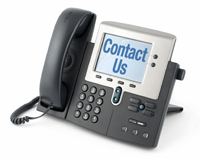 Call us today at 800–564–4215 to get started. Your website is a reflection of your practice. And just like you might touch up your waiting room with a new coat of paint, add some new equipment to your diagnostic lab and otherwise change things up, you need to update your website. Updating your website is about more than just keeping a fresh appearance, though: updated content, new photos and other changes to your website can help boost your search engine rankings and help you overhaul your practice’s marketing plan. Google, Yahoo and other search engines love new content. Once search engine spiders have found and indexed your site, they return frequently to check for new content. The more often you update your site, the more often the search engine spiders return—and the better your search engine rankings become. However, if your site is not updated, the search engine spiders will stop returning, and your rankings will tumble. Regular website updates can go a long way to keeping your hospital’s search engine rankings near the top. If you haven’t updated your site in a few months (or a few years! ), your practice has most likely gone through considerable changes not reflected on your site. You may have new surgical equipment, new staff members and even some new associate veterinarians. Your existing and prospective clients won’t know about any of these changes unless you update your website. You can use these updates as a way to reach out to the community, as well. Use your website to announce new promotions that you’re running or the arrival of a new veterinarian. If your website is still advertising a dental special from 2007, it’s no longer accurately reflecting what your practice offers. A different haircut or some new shoes always get noticed. When it comes to your website, it’s no different—a few cosmetic changes can go a long way toward bringing new visitors to your website. If you have an existing website but haven’t changed much on it in the last few years, now may be the time for a complete redesign. Website design standards have changed considerably in the last five years. On the web, appearance is everything, and your site should be as fresh and professional-looking as possible. And if you’re working a new marketing plan for your practice, consider redesigning your website as part of that plan. Update your website today! Whether you need to add some new photos, update your site’s content or do a complete redesign, VetNetwork can help. 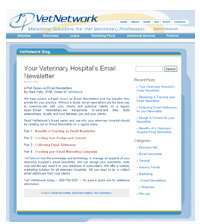 Email us at updates@vetnetwork.com or call 800–564–4215 to get started. Whether you’re looking for tips on how to market your practice and get a grip on the tumultuous economy or want to know more about the latest pet trends and news items your clients are talking about, visit VetNetwork’s blog at wp.vetnetwork.com. Check out our latest posts, leave a comment or two and send us suggestions about topics you’d like to see covered in the blog. At CVC East – Baltimore! Dr. Mark Feltz, owner of VetNetwork, will be hosting four presentations at this year’s CVC East Conference in Baltimore on Monday April 27. Dr. Feltz will cover the latest trends in veterinary marketing and the tools veterinarians need to thrive in the new economy. Check out the cvc.com for more information or to register for this year’s conference!